Dandiya parties or pujas at home, Navratri is a time to look gorgeous! Check out these gorgeous hairstyles for Navratri nights. It’s that time of the year again. So ladies, bring out your lehengas and book your salon appointments, it’s navratri! The glitz, glamour and energy of this season really brings the world alive. There’s a lot of socializing, a lot of dancing and not to mention a lot of dressing up. And who doesn’t want to look perfect for these 9 nights? Keeping that in mind, we have brought you 10 gorgeous hairstyles that you can flaunt this navratri! When you speak of dandiya, and navratri Deepika Padukone is the first diva that pops into your mind. After her recent success in Ram Leela, every girl wants to emulate Deepika’s stunning ethnic style. She manages to make her style look effortless but oh-so-glamorous at the same time. Take a leaf out of her style book with gorgeous hairstyles like this one – a messy bun with an invisible maang tikka is the perfect pick if you are going for a slightly more traditional look. The careless style of the bun nicely offsets the boring traditional quality of your outfit and adds a certain quirk to your look. Not to mention, it is super easy to achieve and pull off. For a slightly more sophisticated look go for the pulled back bouffant, that Deepika flaunts in this picture. The bouffant is not struggling to stay in place and the hair at the back is left to cascade down her shoulders. This look will work well with a sari as well, if that’s something you would like to explore. Another way of looking ultra-glamorous is accessorizing your look with a more elaborate headdress. Remember to keep your hair softly curled and open. 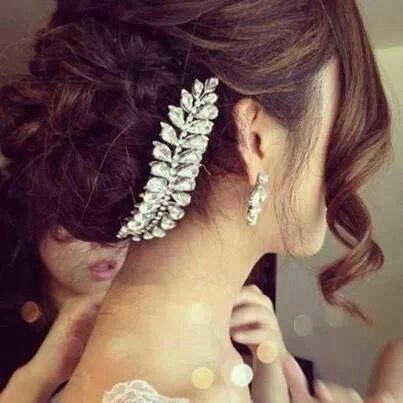 This is another gorgeous but easy to achieve hairstyle which just requires some basic styling and products. With all the chaos and hungama of the navratri nights, opting for a bun may be your best best. A bun doesn’t necessarily have to be aunty-like, in fact it can be made to look quite chic. 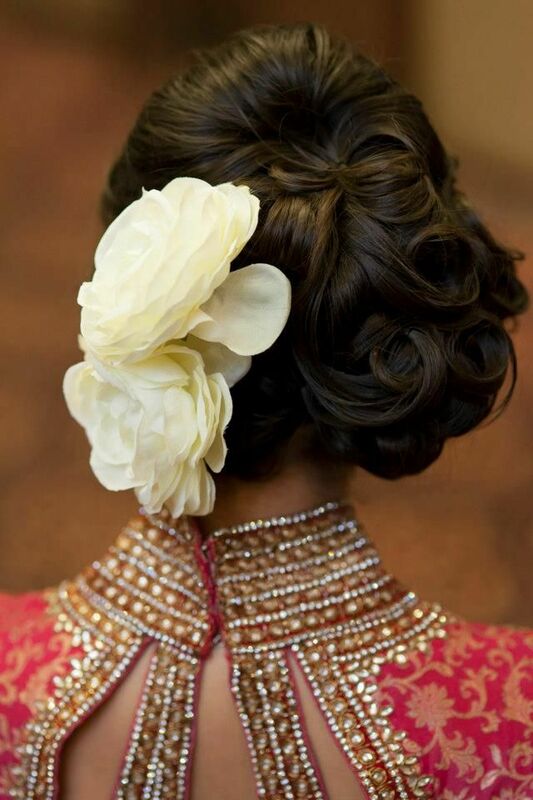 Accessorise your bun with some beautiful flowers or an elaborate clip which will hold your hair together. Remember to keep a flirty little tendril of hair free, that takes the severity of the look out. Pair this look with subtle make up and stylish, modern ethic clothing for best results. If you are one of those girls who is blessed with naturally beautiful hair, (we’re so jealous) you may just want to keep it open. You can make this look seem different than your everyday look with just a big brush and hair dryer. Blow dry your hair to sit properly on your shoulders and frame your face to perfection. Long hair provides many many options for their owners. For those of you who really want to experiment with something totally out of this world, opt for this side swept hairdo. It’s so beautiful, it’s a sure shot hit! For those of you who are looking for a simpler option – the braid is the easiest. Not only is the most practical option for a navratri hairstyle, it also provides a huge scope for accessories or you can go for a bouffant with a gorgeous clip that holds it together. Keep your hair conditioned and styled to make it look as beautiful as a movie star’s! Keep watching for more navratri special style tips!